Blog Home > Docks & Shipping > 11% of Forklifts are Involved in Accidents Annually. What Can You Do? "If you have a forklift, it is almost surely the most dangerous piece of equipment under your roof"
Of these accidents, collision type accidents account for approximately 46% of the total (adding the statistics for individuals crushed either between two lifts or between a lift and another surface, and pedestrians being struck. From a training and process standpoint, there is plenty to be done. But there are also options to help control traffic and raise awareness. The most basic is to install steel guardrails to control traffic. It does little to actually inform forklift drivers of pedestrian presence, but it does help to define areas such as work cells and keep forklifts where they belong. They can shield work cells, define aisles, and guard columns. 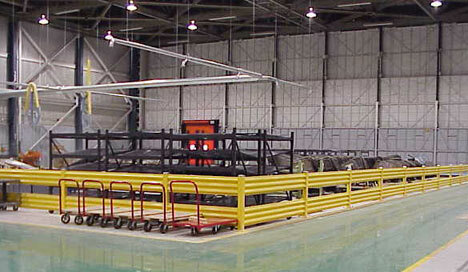 They can put hard steel between pedestrians, machinery, offices, and other critical areas and forklift traffic. To help increase visibility and keep the dangers top of mind, there are motion sensor based technologies such as Collision Awareness warehouse traffic sensors. These are like traffic lights for your warehouse, ideal for blind spots, corners and intersections in warehouses, manufacturing, and other forklift operation areas can lead to serious accidents that cause injury and death. Collision Awareness systems help safeguard employees, equipment, and inventory by creating awareness of oncoming traffic at dangerous intersections. In pedestrian aisles, AisleCop forklift safety gates prevent pedestrians from entering an aisle while forklifts are present. This system utilizes radar motion detectors and intelligent controls to control the flow of traffic, close gates, and notify forklift operators that pedestrians are present.